Not quite ready for the challenge of a Signature class? No worries, our Pilates Classes will help get you into shape in a more progressive manner. While our signature classes were designed to compliment our Pilates programming, the classes are open for anyone to join. The goal is for clients to work larger muslce groups at a quick pace. Muscle shaking and fatigue go hand in hand with these workouts, so be prepared to feel the burn! A four week trial class is the perfect way to try these classes and see if they are the right fit. The signature classes are all challenging. If you have a “back issue” or are recovering from an knee/ankle or foot injury we suggest taking an introductory Pilates class first. Here you can strengthen your body and prepare yourself for the intensity of our Barre45, TRX and CoreBall classes. Our programming is original. 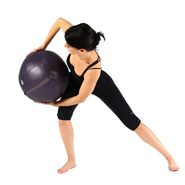 We do offer certification programs for the Pilates North method. We also provide training for those interested in incorporating the TRX, Barre and Ugi into their clients workouts. Contact us for upcoming dates. A skating coach told me about Pilates North 4 yrs ago and I have been a regular ever since. I trust Lisa and respect her knowledge and expertise. The fitness that we develop in her classes is the foundation that I build all my other sports (skating, running, swimming, golf) upon. Let’s face it, as we get older it gets harder on the body to be physically active. Her classes keep my body balanced and strong so that I can continue to pursue an active, athletic lifestyle. I have done many types of workouts and trainings in the past, including competing on a dragonboat team. I wanted to find a workout that is effective but not too stressful on my body. Pilates is just that. After a class, I feel refreshed and it lasts thru out the day.The studio is pleasant,bright and airy. Location is perfect for me. Of course, none of this would be possible if it weren’t for the staff. Always greeted with a smile and a good word, I look forward to my session with Gina. Looking forward to the next session. I have been attending Pilates North for over a year. In this time, I have had the opportunity to attend various classes. Not once have I been disappointed in the level of instruction and most importantly, the level of care for the clients. Each instructor makes the effort to get to know their clients so to best support their individual goals. My weekly classes are my time to focus on myself. I have most definitely found my niche and Pilates North has been instrumental in this process!